Since Jeremy Clarkson’s dismissal, rather farcically, the BBC ‘rumor mill’ has been doing overtime. 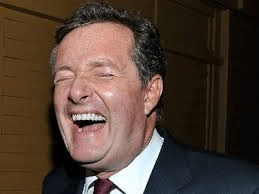 With Donald Trump, Bill Cosby and Noam Chomsky all previously linked with the vacant role, the fact that Piers Morgan has just been unveiled as Clarkson’s ‘Top Gear’ replacement will shock and anger many. The journalist and former altar boy, recently named The Most Despised Man in the Western Hemisphere, will join Richard Hammond and James May on the much loved TV show. For more than a decade, Clarkson and Morgan have been engaged in a brutal and engaging feud. This past Saturday, an unexpected revelation surfaced. Taking to Twitter, Morgan revealed that he had accepted the offer after a “five-hour long drinking session at a pub” the previous night. According to Morgan, a BBC official sent the fired-CNN host a text message offer, simply requesting that he reply ‘In’ or ‘Out’. The notorious feud began more than a decade ago when Morgan — then a binman in London — rummaged through Clarkson’s thrash and found compromising photos of the car enthusiast intimately engaged in a sexual act with the exhaust of a Porsche 911 . In 2006, the feud reached boiling point after Clarkson threatened the recently fired binman with physical violence, and a year later, Clarkson carried out his threat by performing a stunner on Morgan at the National Press Awards. After recovering from the maneuver made famous by Stone Cold Steve Austin, Morgan promised revenge.